"This book changed my life as a teacher!" "I loved it! So enjoyable to see the principles in story form." "The most refreshing teacher book." "It ought to be required reading for all teachers." "I wish I had read this my first year teaching!" "I saw bits of myself in each character." "A wonderful book that will help any teacher." "It’s so easy and fun to read!" "An essential resource for teachers." A smattering of smoky remnants is all that remains of the once promising fire of success in the classrooms of East Crossroads Middle School. The teachers, each having entered the profession with blazing ambition, now struggle to protect their feeble flames from the billows of student indifference and waning motivation. Within days of unpacking, Mrs. Kris Able, expert teacher turned guidance counselor, is unintentionally thrown into the ashes of the mess. With wisdom and experience, Kris leads the teachers of East Crossroads on reflective journeys in classroom culture creation. From the burst bubble of a enthusiastic first year teacher to the authoritarian habits of an old, burnt-out science grump, from the super cool history teacher to the haughty theatrics of a doctor of mathematics, Counselor Kris instigates change, little by little, by teaching her colleagues four empowering principles of creating a classroom culture of success. With identifiable characters, applicable lessons, and an enjoyable plot, Empowered’s beautiful blend of tips and tales is as informative as it is entertaining and inspiring. Kris observed the groups of teachers collected together around the mismatched assortment of round tables. Some gathered with forced smiles. Others quietly ate their lunch in solitude. A few openly commiserated about the upcoming nine months of doom. Kris mentally summarized in a single word the lounge’s collective feeling – stress. She saw it in their shadowy eyes and slumped shoulders. She saw it in their forced smiles and shrill voices. Truth be told, they looked much like their own rewarmed leftovers. I might be counseling more than students this year, Kris thought to herself. Change. Why is change so hard? Green leaves change to red. Winter changes to spring. Night changes to day. But a man can’t put his wallet in the other back pocket. He can’t wear his watch on the other wrist. He can’t bring himself to drive a different route to work. Yes, he can identify a bad habit, but he has the hardest time changing what he knows he should. While the world seems able to cope with change, he who inhabits the world separates himself by – not. Alex sat at his desk the following Monday morning, suppressing his anxiety and feeling uncomfortable with the changes he surveyed before him. The evidence of his work the previous weekend was apparent all around. Clean desk. Organized bookshelves. Clear directions written on the board. Copies of assignments for the next two weeks neatly filed away. As the time approached for his students to enter, Alex stood to ready the last details of the day. The movement forced a swish of color to pass through his periphery. He looked down and frowned to see his old, skinny maroon tie he hadn’t seen since senior prom and wished he would have never seen again. Yet there it was, flopping about, exaggerating each movement and mocking him at every turn. To him, the tie was like a pesky little sister, irritating and inescapable. And though he’d been able to remember how to tie it, he still refused to tighten it all the way up. Hey, a man’s got to draw the line somewhere! Teachers, you need to read this book! Written in narrative form, it is a refreshing change from the typical academic teacher book which often amounts to nothing more than an overwhelming list of things you should be doing in your classroom. Instead, Empowered is a relatable, often humorous take on the challenges facing a fictional middle school and one counselor’s quest to help her fellow educators implement incremental, fundamental changes in their classrooms. 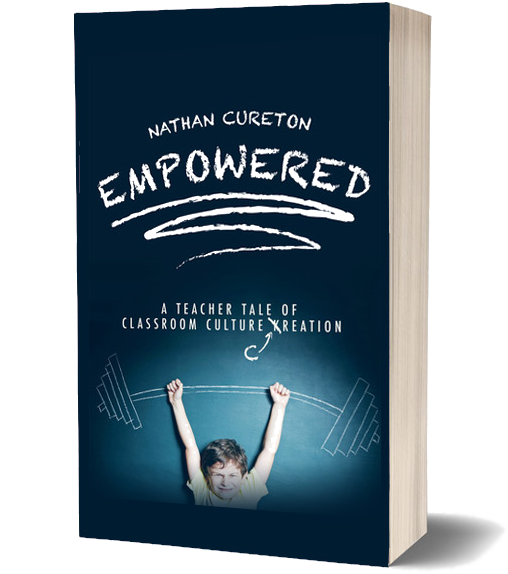 Through Nathan Cureton’s use of the narrative form, he shows you (instead of just telling you) how you can implement four simple but powerful principles in your classroom. As you read, you can’t help but think of your own classroom and how you will address your own unique challenges. I recommend this book enthusiastically for all educators. Masterfully written. This book is a must read for teachers who want to make an impact in the lives of young people. It is packed with “how to” information for creating an excellent classroom culture, but is presented in the form of a novel. The book follows four teachers in a middle school who learn first-hand that they are not connecting with their students as a result of their teaching styles. Through a process of outside advice and painstaking introspection they learn how to change their approach to achieve a better outcome. The book is absolutely riveting as the lives of both teachers and students change and grow because these teachers cared enough to try something new. 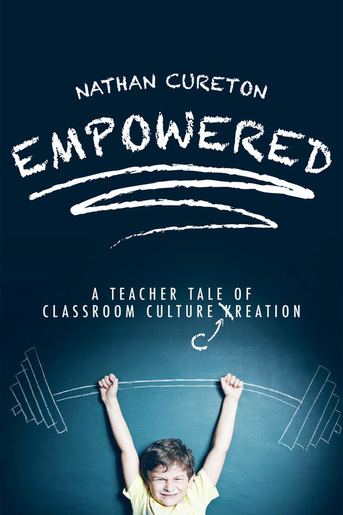 Teachers will come away from this lively narrative empowered with new skills and energized to become the kind of teacher they always wanted to be. Enjoyed seeing the theory demonstrated through the characters. I saw bits of myself in each of them! 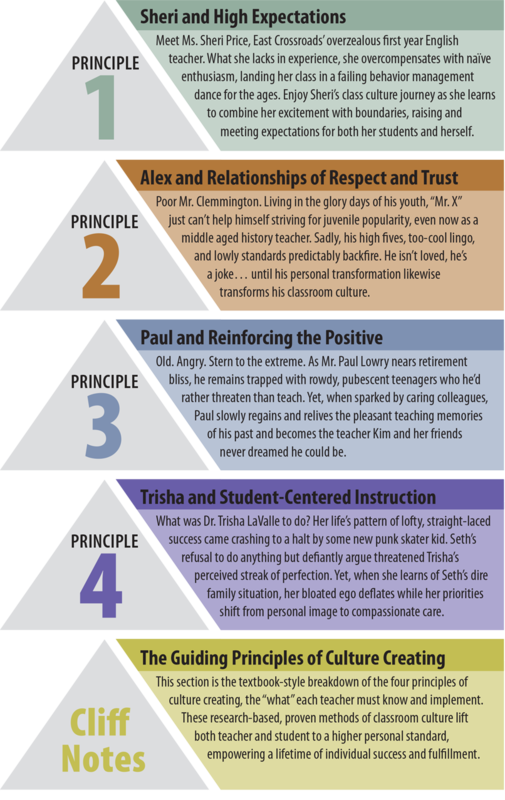 The Cliff Notes are helpful reminders for me as I work to further develop my own classroom culture. Definitely recommend this for all who teach. I loved this witty and clever way to present the most practical ways to teach in a class. Reads like a novel yet is instructive and reflective for me. Every teacher should read this and help children thrive in the classroom! I absolutely loved this book as a teacher. I have been in the shoes of the teachers in this book, and I relate very well. The principles work. I wish I had read this my first year teaching. It is an easy read that is still very insightful.